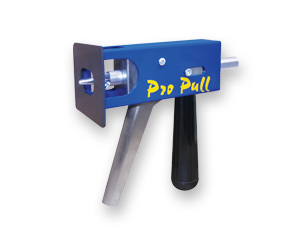 Pro Pull is the latest in dent pulling technology for the collision industry. This tool makes dent pulling an art! It's designed to be extremely flexible. Thanks to the replaceable blocking plates and the adjustable weld shaft, the operator has a lot of options available in how to maximize the pulling technique used when straightening the dent. Designed for both aluminum and steel dent pulling. Our new Pull Bar features a 4 and 6 Jaw clamp, and adjustable foot swivel pads for mounting both vertically and horizontally. The dent pull bar makes dent pulling extremely easy, quick and accurate. 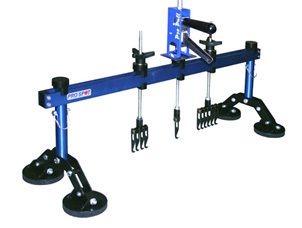 The pull bar can also adapt to the Pro Pull system for isolated dent pulling. The spot hammer welds directly onto the work area and pulls the dent. To release, simply twist the hammer sideways, reposition, weld, and pull again. This procedure is by far the fastest dent pulling system on the market, and no consumable washers or studs are needed. A spot hammer weld leaves no hole after the procedure, just a smooth, dent free surface. When more pulling power is needed, simply increase the current. The replaceable welding tip on the Spot Hammer tip will last for over one thousand welds. Single sided welding feature on the i4 is not to be used for structural or panel replacement, but is extremely affective for cosmetic patching. With the single sided tip, you can, also, imitate the factory appearance of resistance welding by making indentations over the MIG weld. The i4 can also be fitted with a stitch weld adapter enabling the operator to lay staggered bead type welds. While rolling the tip on the sheet metal edge, the welder will automatically deliver an intermittent or pulsating current. Just keep the trigger depressed and roll the tip. This procedure works like a dream on stainless steel, and therefore lends itself well to rust repair and patching. It's easy to use and can be manipulated to fit any shape or form you require. You can even weld pulling tabs onto areas needed to be pulled. How's that for versatility! The welding of washers offers variety and flexibility when it comes to performance dent pulling. When welding on washers, you only need to clean the area where the washer touches the metal since the grounding system with i4 is connected through a separate cable. Simply burn on the washers, using the adapter electrode (shown on the left), to the area desired, hook the washer with the slide hammer, and pull out the dent. Washers can also be used for pulling with a clamp. Weld on 3 to 4 washers vertically, attach a pulling clamp, and presto. The procedure does not damage the washers, so they can be used over and over again. Welding of 2.5x 50mm Nails for dent pulling is just as easy. Just insert nail into a holder, weld it on and you are done! PS-830 Electrode shown. PS-1201, PS-1202, PS-230 Bolts available. As you know, many of today's car bodies come with factory equipped threaded studs. After a collision, the studs may be lost or do not accompany the replacement part. With the i4, threaded studs can be welded on in factory style. This type of stud is also common throughout the car body for attachments of interior, tail lights, door moldings, etc. Weld on nuts can often be substituted for threaded studs in these areas and are applied with ease using the i4. A threaded stud can also be used to fasten the ground clamp directly to the panel, minimizing the area needed for grinding. 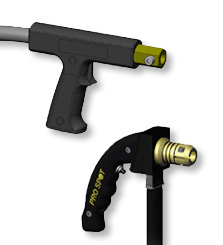 The PS-870 is the combination of the PS-800 and PS-860, this duel sided tip is both rivet welder and contact shrinker. This function will weld on factory type clips for the window moulding. The clips that hold the moulding do not come on the replacement parts. Simply insert the rivet into the adapter and weld it in place. Quick and easy. Dent pulling with washers creates high spots in the metal. Until now, the common practice would have been to grind the surface, resulting in a loss of sheet metal thickness. With the i4, simply use the shrinking tip instead of a grinder to remove the high spots, leaving a smooth and clean surface that's every bit as thick and strong as before. Shrinking electrode also acts as a 6mm threaded stud adapter. 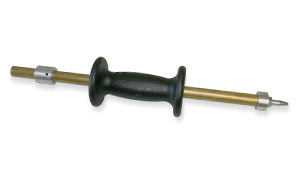 It holds the stud in place while you weld, providing comfort and precision stud placement. With this electrode you get two convenient tools in one. The versatile i4 also features metal shrinking utilizing its carbon rod adapter. First, the operator heats the panel to the appropriate temperature, then cools the surface with a wet rag or compressed air. The carbon rod can also be used on sharp dents caused by such things as hail.